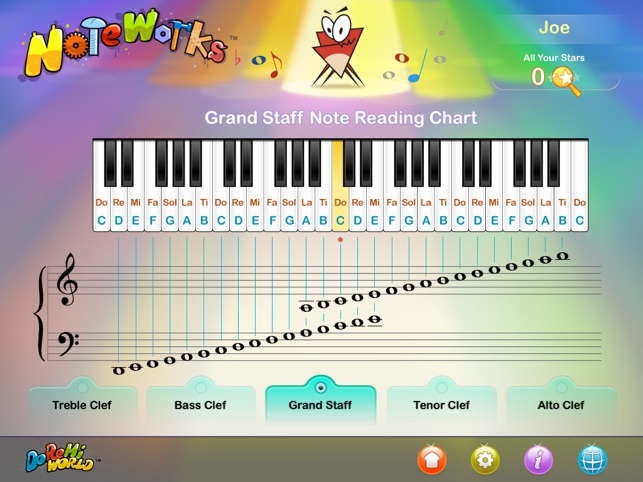 NoteWorks is a musical game, designed to teach note recognition and improve sight reading skills. Hungry Munchy is eager to swallow elusive blue notes. 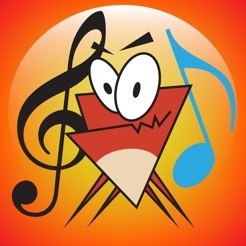 Your goal is to help Munchy catch each note as quickly as possible. 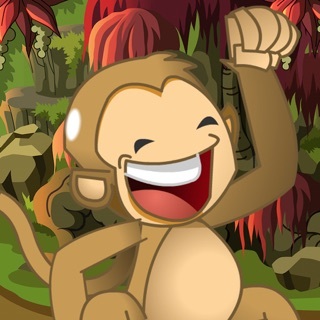 The game combines learning and fun into a single gratifying experience. The app is both educational and entertaining, with an intuitive and visually appealing interface. • Players of all ages. • Beginners to advanced music students. • Families with multiple players. • Music teachers with multiple students. • A funny animated character. 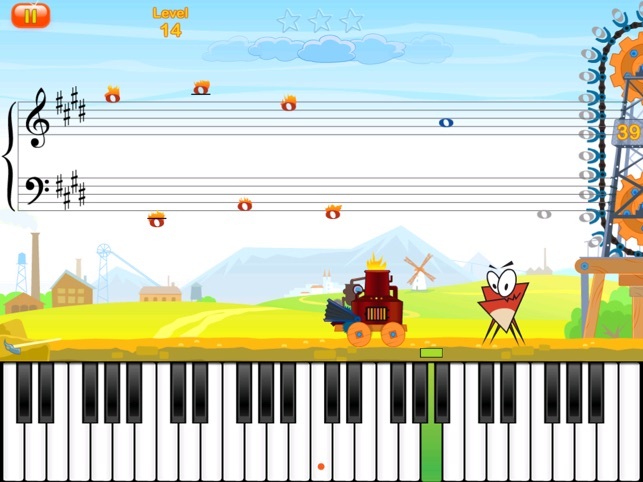 • On-screen piano keyboard input. • "A, B, C" note naming. • "Do, Re, Mi" note naming. • Students learn by playing a game and having fun. • In practice mode, students are helped with hints. • In challenge mode, students play for points and stars. • Students learn to recognize notes instantly, on sight. • The game can adjust and progress automatically for each player. • For beginners, the game starts by teaching a limited range of notes. • Note range gradually increases as students advance. • After mastering accidentals, students learn key signatures. • Game speed is easily adjusted to increase or decrease difficulty. • Students can use custom game settings to stay in full control. 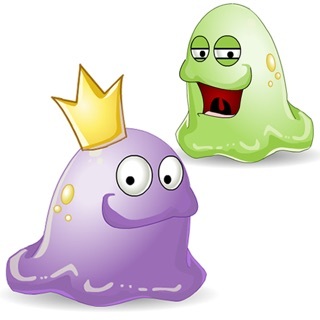 • Sharing of game progress: ability to share game results with teachers. 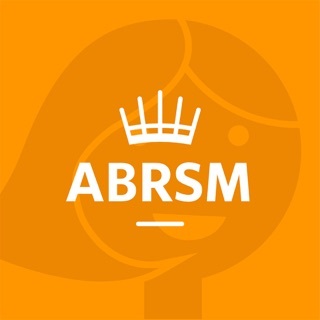 While music teachers persistently stress the importance of sight reading, most teachers prefer not to spend valuable lesson time on basic note recognition skills. Thus, NoteWorks helps music teachers concentrate on more interesting aspects of their art, such as technique and musicality. Serious music students can take advantage of the game to learn clefs outside of their own instruments, as well as prepare for music theory exams. 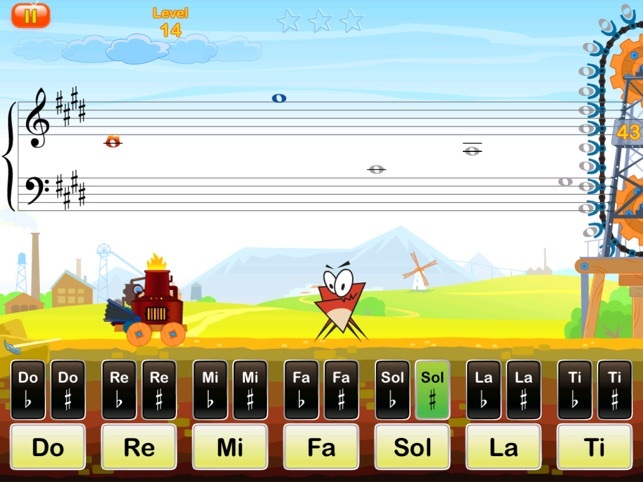 In addition, non-musicians could use NoteWorks as an interesting memory game, to help keep their minds sharp and quick. 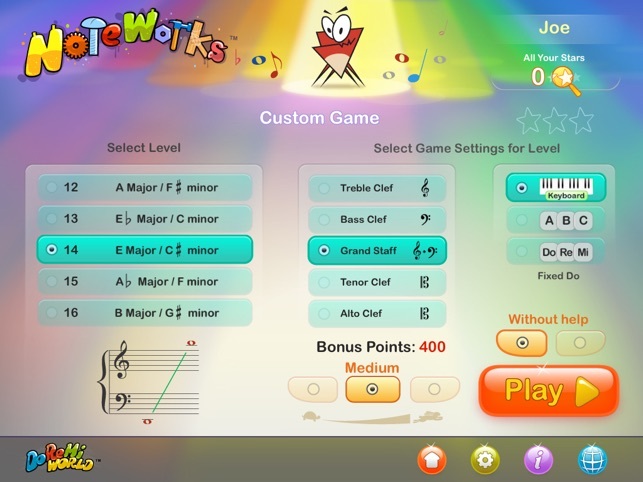 NoteWorks was created for people who like to learn by playing and having fun. It was designed with the objective of neither being too easy nor too hard, and never boring. We hope you'll find NoteWorks both useful and entertaining, and we would greatly appreciate it if you could share your thoughts and opinions about the game by rating it. 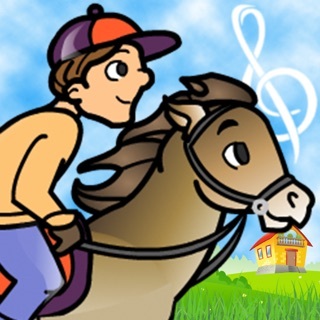 This app is so involving and fun, pesky notes are mastered quickly! Great how it advances you automatically according to your progress which helps you be brave, still with full override ability to control moving on or going back etc. to focus attention where you want. Only suggestion I have is for note letters to appear momentarily on key presses in keyboard mode, would reinforce those associations subliminally to great advantage. I've been using this app for several months and find it is helping me remember the notes. At first I thought it was childish, but the process of learning to read music is the same no matter what age you are. I also put it on my Iphone so while I'm on the bus or train, I can practice on the go. I'm really glad I found this app. I eventually bought the full program. I really like that there are so many variables to set for my students. I have used it in my studio for years and had many names that were no longer used. I couldn't figure out how to delete the names. When I called their corporate office there was friendly and prompt response. Now the app is ready for a new group of names. I am a happy customer.